While many imaging apps’ tools closely resemble those used by artists in the real world – such as brushes and pens – the color picker feels like a completely digital device. A new project from the folks at Adobe Research and University of Toronto reimagines it as a skeuomorphic palette that’s designed to be more natural and intuitive, while allowing for the creation of harmonious color schemes and works of art. As you work, each blob of color is saved into an infinite history so you can retrieve a palette whenever you need it. You can also derive a palette from an image. It’s a clever idea that not only seems like it’d be fun to use, but the research team says that the professional artists they tested it with found Playful Palette to offer more creative support than the standard HSV pickers we use today. 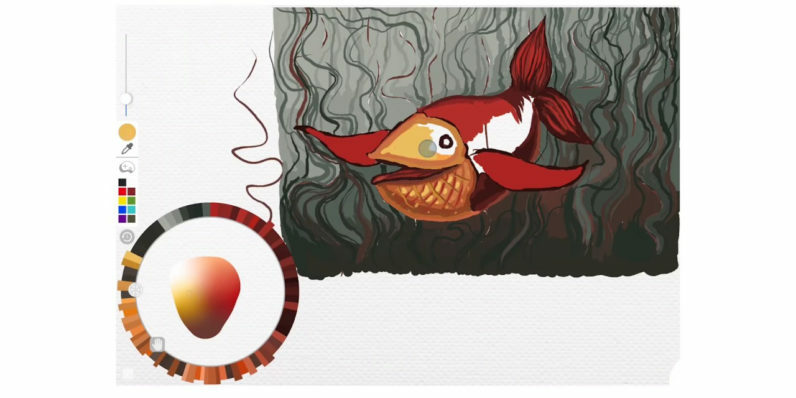 Adobe hasn’t said anything about incorporating Playful Palette into its software, but it’d be great to see the tool made available to digital painters and illustrators – even as a plugin. The researchers will present their paper (PDF) at SIGGRAPH 2017 later this month; hopefully, it’ll drum up enough interest to be picked up and turned into a real piece of software we can all get our hands dirty with soon.